Kara Doufash is seen during a protest against the travel ban imposed by President Donald Trump’s executive order at Los Angeles International Airport in Los Angeles. While Trump’s order has outraged many, It is worth remembering that his actions are not an aberration in American immigration history. On Jan. 27, President Donald Trump signed an executive order barring the entry of foreign nationals from seven Muslim-majority countries — Syria, Iran, Sudan, Libya, Somalia, Yemen and Iraq — for at least 90 days. In addition, the president’s executive order, “ Protection of the Nation from Foreign Terrorist Entry into the United States,” suspends the admission of non-Syrian refugees for 120 days and bans the entry of Syrian refugees indefinitely. Though mainstream media has correctly reported that foreign nationals from the seven Muslim-majority countries targeted by Trump have not been responsible for the deaths of any U.S. citizens on U.S. soil from 1975 to 2015 nor has any person accepted to the U.S. as a refugee been implicated in any terrorist attack since 1980, such commentary has failed to consider the longer sweep of white supremacy and xenophobia in U.S. immigration history. While many of us are outraged over Trump’s executive order — one indisputably tethered to white nationalism and Islamophobia — it is worth remembering that the president’s actions do not constitute an aberration in American immigration history. On the contrary, racial, national origin and religious immigration quota systems have long been integral to America’s approach to regulating the freedom, movement and rights of non-white people and bodies. Such laws have been aimed at protecting the religious and racial purity of whatever is indexed in a given moment as best representing the most undefiled form of American nationalism. While the Naturalization Act of 1790 established the first “racial test” for naturalization — it restricted naturalized citizenship to “a free white person who shall have resided … in the United States … for two years” — the Chinese Exclusion Act of 1882 represents the first major national origin statute restricting immigration to the United States. Congress passed the act at the end of the 19th century in response to white, native-born fears over wage depression at the hands of “racially-inferior” Chinese laborers living on the West Coast. The act effectively halted Chinese immigration until 1943, when 105 Chinese immigrants a year were eligible to enter the United States. The Chinese Exclusion Act set a dangerous race-based precedent for exclusionary immigration laws. The Immigration Act of 1924 — a piece of legislation recently praised by Sen. Jeff Sessions, Trump’s nominee for U.S. attorney general — dramatically limited the number of immigrants allowed entry into the United States through a national origin quota system. Signed into law by President Calvin Coolidge on May 26, 1924, the bill capped total annual immigration at about 165,000 — less than 20 percent of the pre–World War I average — by establishing ceilings on the maximum number of immigrants allowed from any given country: specifically, 2 percent per year of the number of immigrants from a given country as recorded in the 1890 census. The choice to peg immigration to that census was far from arbitrary. Since the 1890 census reflected a higher population percentage of “desirable” northern Europeans than any of the subsequent three censuses, people from those countries enjoyed artificially inflated immigration and naturalization opportunities under the new quotas. To be sure, this provision was no doubt meant to establish an advantage to Anglo-Saxon Protestants who represented the majority of the U.S. population in 1890. In his 1916 bestseller, “ The Passing of the Great Race,” famed eugenicist Madison Grant argued that while northern European immigrants of the 19th century were “skilled, thrifty, and hardworking” just like native-born Americans, more recent immigrants from southern and eastern Europe were “unskilled, ignorant, predominantly Catholic or Jewish” and virtually unassimilable. Grant, among other eugenicists, was tapped as an expert to speak on the threat of “inferior stock” from eastern and southern Europe and played a critical role as Congress debated provisions of the Immigration Act of 1924. At the urging of Grant and others, the act did not include any provision whatsoever for immigrants from Asian countries. The bill stipulated “the absolute exclusion of the aliens ineligible to citizenship,” a code for Asians. This continued a longstanding policy in existing immigration laws dating from 1790, 1870, 1882 and 1917 that already had excluded most Asians from naturalizing. Exceptions to these blanket prohibitions included Japanese and Filipinos. But the Immigration Act of 1924 — in conjunction with the U.S. Supreme Court’s 1922 ruling in Ozawa v. United States, which found the Japanese “not white” and therefore ineligible for U.S. citizenship — closed even these loopholes. These quotas and prohibitions would stand until the midcentury, when Congress in 1952 eliminated race as a basis for naturalization and in 1965 jettisoned the national origin quota system, finally invalidating the Chinese Exclusion Act. The omission of race-based, national origin and religiously-motivated immigration policy history from mainstream discourse leaves us with the false impression that present debates over the so-called exceptional nature of Trump’s travel ban from several Muslim nations has very few precedents in the United States, when in fact there are many in the not so distant past. To responsibly address our relationship to the past — and to eschew the same white supremacist and xenophobic mistakes — contemporary debates about Trump’s ban must remind us that we have been down this road before, to disastrous ends. 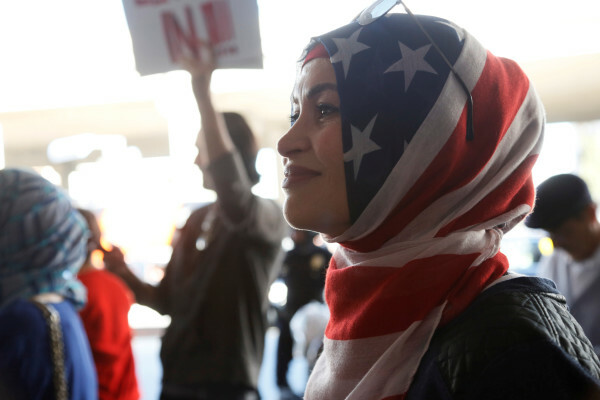 A racial, national origin, or religious immigration provision of any kind should be unequivocally rejected for what it is: an instrument of white nationalism and Islamophobia deployed to manipulate the most fashionable and convenient iteration of our fear of “outsiders.” Rejecting and resisting the idea of a Muslim ban must be one of many steps in denaturalizing the linkage between whiteness and Americanness, between the history of racial, national and religious exclusion and the full flourishing of U.S. democracy. Christopher Petrella is a lecturer in American cultural studies at Bates College in Lewiston. His work is curated at christopherfrancispetrella.net. Follow him on Twitter at @CFPetrella. A version of this piece was originally published in the Boston Review.